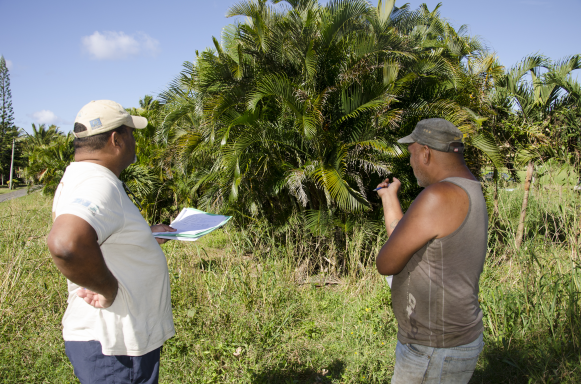 Stephen (left) and Nat (right) talk about the plot of land to be used for growing the organic papaya. On a visit to the Cook Islands in October 2015, while in Rarotonga, I had the opportunity to join our colleague Stephen Hazelman, Organic Systems Extension Officer, from The Pacific Organic and Ethical Trade Community (POETCom), and Teava Iro, founder of the Tikitaveka Growers Association, a local NGO implementing the three-year IFAD project, Capacity-Building for Resilient Agriculture in the Pacific. The project focuses on building the capacity of organic associations to support farmers and on developing agricultural resilience. It is helping to address the growing social and economic concerns of rural households who have low incomes and are unable to produce enough food, meaning that they have to rely on cash remittances from family members who have migrated. As well as the Cook Islands, two other countries in the Pacific will be benefiting from the Capacity-Building for Resilient Agriculture in the Pacific project – Niue and the Marshall Islands. The project will concentrate on these islands’ young people, who would otherwise migrate to New Zealand or Australia in search of work. During the week before my arrival, a three-day workshop, where the IFAD-funded project was presented, was held at the Papaaroa Community Hall and was attended by 21 farmers. The outcome of the three days was that a participatory guarantee system was developed and a set of rules was established for growing organic crops. Peer reviews will be carried out to ensure that participants comply with the rules that were agreed by all parties. Teariki "Nat" Unuka, is one of the 21 local farmers in Rarotonga who attended the three-day workshop. He is one of the biggest users of pesticides on the island. During the workshop, he had a chance to talk to other farmers and showed his interest in taking part in the IFAD-funded project. The day we met with Nat, Stephen carried out an interview to find out if the plot of land where he will be growing his organic produce met the specific requirements that allow him to take part in the project. In the past, Nat had grown papaya here. Currently the land is not being used and the only plants growing, wild, are some decorative palms. 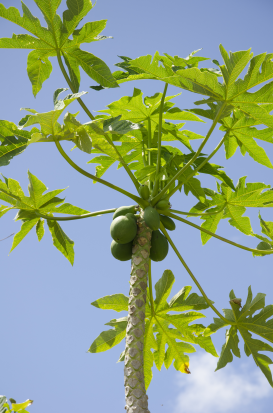 His plan for the future is to use the land to grow organic papaya and if he is happy with the results, he will move to organic growing on all of the land he owns. In order to proceed, Stephen interviewed Nat to gather information about the plot; when was the last time he had grown crops on it, what had he grown in the past, do his neighbours use pesticides, etc. The outcome of the interview was positive and Nat will be one of ten farmers who will be taking part in the project.